At Custom Cabinetry Unlimited we take small spaces and transform them into highly functioning areas with bright colors and distinctive finishes. When you are looking for custom cabinets in Chester County with great detail to suit your needs, we are your best choice! Our designs provide function to cabinets and best utilize the space that’s available. The finishing touches on our custom built, high end cabinets are inviting and showcase the excellent craftsmanship we provide. Replacing kitchen cabinets or bath cabinets is an affordable option that has huge results. Recent surveys show that an up-to-date kitchen or bath greatly increases your home’s value, as well as makes your life at home more enjoyable. We'll help you invest in new custom made cabinets that show your personality and creativity. If you reside in Philadelphia or in outlying Chester or Lancaster Counties, you enjoy a wonderful opportunity to obtain fine tailored wooden cabinetry through Custom Cabinetry Unlimited. Let our skilled woodworkers enhance your residence with beautiful custom built cabinets. Begin the process of transforming your dwelling into a genuinely unique, personalized living space. Contact us today for an estimate! By including our elegant custom made cabinets in your home, you can create a one-of-a-kind look that is personalized to your space. Whether you require built in cabinetry, a new wardrobe cabinet or a credenza for displaying treasured possessions, you'll appreciate the superb quality of our work. 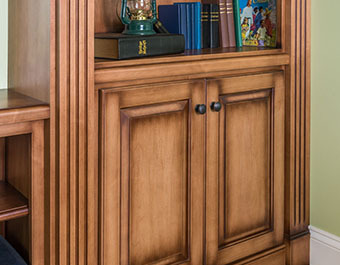 We strive to enrich our customers' lives by providing exceptional custom cabinets! Ask us to install custom made cabinetry in the kitchen, the bathroom, bedrooms, and guest quarters. Choose custom built cabinets that reflect your unique sense of taste and design. We'll show you different examples of our work, so you can see in advance how custom built cabinets will translate your vision for your home into a fashionable reality. Ask us to add the interior features which most appeal to you like built-in silverware dividers, handy under-sink organizing compartments, or top and bottom revolving trays, also known as a Lazy Susan. We want you to be completely satisfied! By selecting custom built cabinets, you obtain the ability to include features such as glass doors or individually-selected cabinet hardware. You also have the option to choose among different installations including inset, beaded inset, ½” overlay, and full overlay. Pick the custom cabinet door options which enable you to develop a genuinely unique, yet stylish, decor. When you order our custom built cabinets you can let us know your finishing preferences. Our company has an expert finishing department that will develop unique colors for your cabinetry. Having our own matching system allows us to match anything to create your own custom cabinet color. We'll preserve and extend your existing decor, or help you to develop an entirely new one if you desire. Our excellent inventory of stains and finishes permits us to give wood the texture, polish and subtle finishing hues required to meet exacting standards. We'll apply glazes, glossy polishes or paints to help achieve your design objectives. We can do any type of finish including antique, worn-look, distressed, traditional, paint and glaze, stain and glaze, as well as any paint color. No matter what you are hoping to gain with your new custom made cabinets, we can accomplish it. Are you a homeowner looking for custom built cabinets in Chester County with unlimited possibilities? At Custom Cabinetry Unlimited, we specialize in offering top of line custom built cabinets at an affordable cost! Whether you are looking for small updates or brand new custom cabinets, our team of experienced professionals can help. We will work with you to discuss the type of improvements that you have in mind, as well as offer you suggestions that will suit your needs and budget. 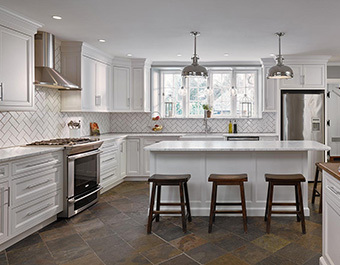 Call Custom Cabinetry Unlimited for an initial consultation today!